and semi-extensive; cheese making and milk selling; organic and non-organic. Having said that, the region covered (Andalusia), although it is the largest region for goat dairy production in Spain, does not represent the whole country. Some production occurs in northern Spain, although it does not contribute significantly. We have included four different dairy breeds, so different genotypes in terms of breeding intensity are covered in this study. Selected breeds are: Murciano-Granadina, Malagueña, Florida and Payoya. These cover the main breeds used in Spain, with the exception of the dairy systems in the Canary Islands. Our list includes three farms that make cheese and two organic ones. We have found out that some organic farms are seriously considering returning to conventional methods as organic management does not seem to be an advantage for extensive dairy goat farmers. 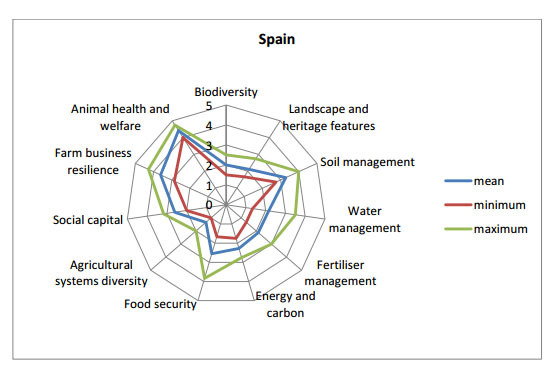 The scores obtained from the rapid sustainability assessment in Spain show a high variation, especially for “Food Security”, “Fertilizer management” and “Water Management” (see Spur diagram). The highest scores were obtained for “Animal Health and Welfare”, “Farm business resilience” and “Soil Management”. The lowest were observed for “Agricultural Systems Diversity” and “Biodiversity”. It is important to point out that the farms selected are based in different areas of south Spain, which include mountains and valleys, arid, semi-arid and temperate weather as well as different marketing strategies. Therefore, it was expected that there would be a range of scores for those spurs strongly linked to the ecosystem where the farm is located. The low scores obtained for “Biodiversity” might be a combination of a lack of legal/financial incentive to work on this area and low awareness of its social and environmental importance. On the other hand, when the individual scores are analysed we could see that there were high scores for those practices that are actually highly beneficial for keeping biodiversity and conservation which are part of the local tradition but not the result of public programs or ‘formal education’. “Water Management” showed a high degree of variation in scores across farms. This was possibly associated with the rather different ecosystems where the 10 farms are placed, basically more technical in valleys than in mountain areas, where farmers rely exclusively on waterfalls and streams. “Fertiliser Management” also showed a wide range. There were some very high N balance figures (mean 221 kg N/ha) influenced by the relatively small land base of some farms. Some farms exported manure because of their small land area. N fixation rate was low (mean 23.2 kg N/ha) since legumes and clover were not commonly grown. Interestingly, there were also some farms which imported manure. Overall, the level of management and planning in feeding and nutrition was very poor and this was discussed at both farmers’ workshops. Farmers have become more aware of this weakness as feeds have risen in price over the last few years. As a general observation, the grazing management with regard to maximizing the potential of shrub land, especially in mountain areas was rather good. However, one particular area which shows great potential for improvement is the supplementation of animals after or during grazing. All participating farms were specialized milk producers. Two of the farms include also other animal species (pigs and sheep) as part of the business. Most of the farmers have been working in their farms for the entire live and o not consider change to another type of business. However, they are becoming more aware of the need to specialize their products to be more competitive. In cheese-making farms, marketing plans are not efficient at all and there is room for much action to be taken. The marketing strategy of one cheese-making farm toward targeting high-end restaurants to sell goat cheese under different ways of maturation (olive oil, herbs, etc..), showed that this ‘a la carte’ strategy could be very successful. The high scores reported on “Animal Health and Welfare” could be a result of the combination of different factors: the relatively low number of animals of the farms, the family type business and therefore strong attachment to the animals as well as the low stocking rate. Excellent records of animal health and welfare and high levels of concern about these issues. One farm is also very involved in educational programs, with constant collaboration with local schools to organize children’s visits over the year.